Calcium-induced calcium release (CICR) in cardiac muscle displays both gradedness and high gain. It is graded because release of Ca2+ from the sarcoplasmic reticulum (SR) is proportional to the influx of trigger Ca2+, and high gain refers to the observation that Ca2+ release from the SR is much greater than the trigger influx. Inherent to such high-gain systems is positive feedback, which causes an all-or-nothing response rather than graded Ca2+ release. Such behaviour is predicted by all mathematical models in which sarcolemmal Ca2+ influx and SR Ca2+ release are directed into a single compartment, or common pool model. The previous (1998) model of cardiac calcium handling, (see Jafri-Rice-Winslow Ventricular Model, 1998) by the authors was an example of a common pool model. While it was able to simulate frequency-dependent aspects of cardiac Ca2+ cycling and high gain, it also displayed an all-or-none rather than a graded Ca2+ release. By contrast, their 1999 model (see the figure below) is based on functional release units (FRUs) formulated from one sarcolemmal dihydropyridine receptor (DHPR), eight ryanodine receptor (RyR) channels, and the volume (subspace) surrounding them. It is assumed that a variable number of independent FRUs can be recruited to produce graded Ca2+ release. Voltage-gated DHPR channels open adjacent RyRs via a localised increase in [Ca2+]. Results obtained with the stochastic model suggest that high gain and gradedness can occur by the recruitment of independent FRUs without requiring spatial [Ca2+] gradients within a functional unit, or coupling between adjacent units. 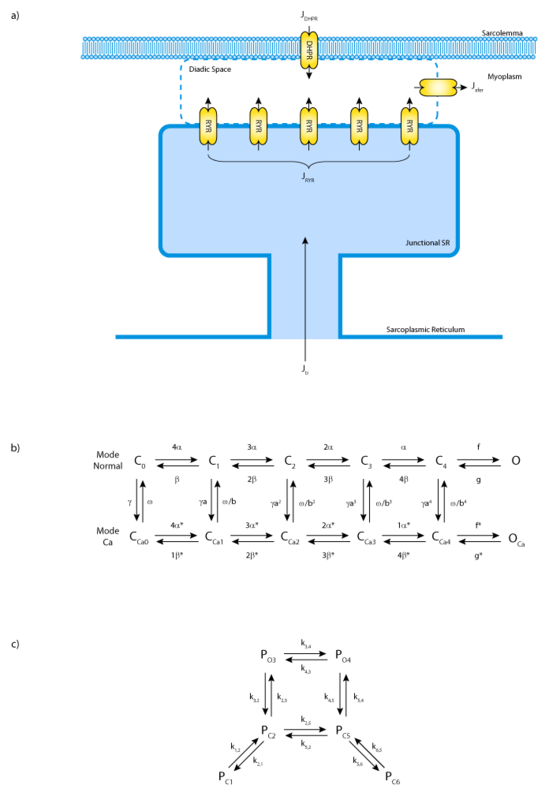 A) Schematic diagram of the functional release unit model. B) State diagram of the DHPR Channel. C) State diagram of the RyR channel. Derived from workspace Rice, Winslow, Jafri, 1999 at changeset 8868a51f5a60.